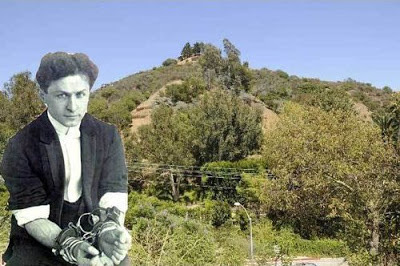 Houdini's house in Laurel Canyon is for sale. No, I'm not talking about the famous Houdini Estate. I'm talking about the hillside across the street where the actual house rented by Houdini and later Bess and Ed Saint once sat. The sale listing says the property includes three lots totaling 14,140 square feet. Asking price is $255,000. Thanks to Curbed LA for the alert and nice mention in their article. Have you put in an offer yet? Hey, all I need is a quite corner for my tent.